Cleaning concentrate with fruity fresh air. Universal foam for all wash lines and portal washers. The addition of a special brush lubricant protects the vehicle lacquers and keeps the textile brush materials clean and slidable. The distinctive, very specific fragrance composition ensures a pleasant fresh air in all plants. Combi Fragrance Foam is pH-neutral. The amphoteric surfactants guarantee a convincing foam pattern even in hard water. Very suitable for biological water treatment plants. nextzett Combi fragrance foam is adjusted pH neutral. The amphoteric surfactants guarantee a convincing foam pattern even in hard water. Care was taken to reduce the net properties in order to ensure a fast, complete rinsing behavior. The surfactants used are, of course, biodegradable and are completely unproblematic in the treatment of industrial water. A universal foam for all wash lines and portal washers. The addition of a special brush lubricant protects the vehicle lacquers and keeps the textile brush materials clean and slidable. The distinctive, very specific fragrance composition ensures a pleasant fresh air in all plants. With the correct setting of dosing pump, water and air pressure, it is very easy to produce a active foam. The consistency and foam volume, can be varied in a wide range, individually according to customer requirements. From voluminous-dry to watery-running everything is possible. End customers often combine foam with cleaning power, which is why a rich, water-based foam is ideal for a positive perception by the wash customer and the rinsing behavior. nextzett Combi fragrance foam is a concentrated product with a balanced proportion of detergent substances. Even dirt particles can be removed easily, even the washing materials, remain clean even during recycling. As a rule, nextzett Combi fragrance foam injected pure by a metering pump in the foam line.Additional air can be added to the product water mixture at the plant side. This allows almost every desired foam image to be realized. 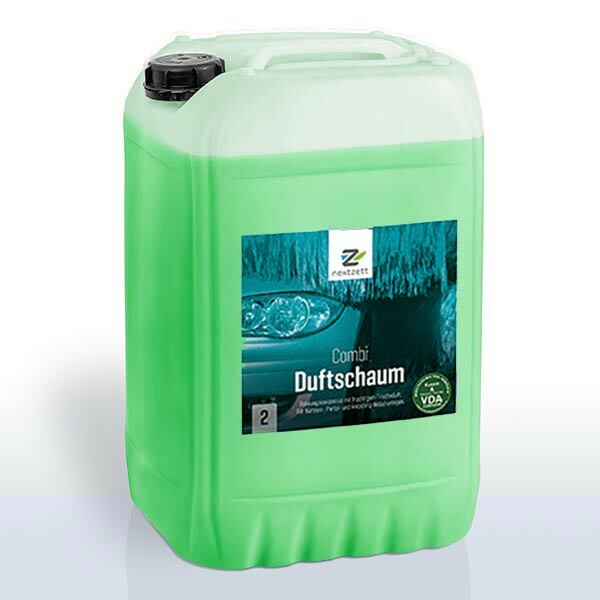 The consumption is between 5 and 20 ml per vehicle depending on water hardness and customer requirements.